The International Civil Rights Center and Museum in downtown Greensboro. The International Civil Rights Center and Museum (ICRCM) has officially paid back its debt to the city. On all accounts that is terrific news. On Thursday, March 1, the City of Greensboro sent a letter to the museum informing its board and management that the city had forgiven a $1.5 million loan made over a two-year period from 2013 to 2015. But with the celebration, came harassment and threats. Museum CEO John Swaine said the museum received four to five phone calls, with the callers abusing the staff with the word, “N***er” and other hateful language. In order to carefully monitor the situation, the museum has suspended self-guided tours for a while. Self-guided tours were one of the items included on the museum’s sustainability plan presented to the city. Operating with a staff of only four employees, Swaine said the museum does not have the resources to properly equip the entire space with advanced security hardware. “We want to make sure we’re exercising good safety precautions. It’s unfortunate that the calls came after such a positive announcement,” said Swaine. The museum has received threats in the past, particularly after the museum denied a photo-op at the facility with then presidential candidate Donald Trump in 2016. But Swaine says the museum is not focusing on the negative, but rather all the community support it does receive. “People from all over the world do come now, and will come in greater numbers, to see a ‘monument’ that is not a tribute to some great man or woman, but to regular people, brave citizens, working to highlight a picture of a more just and inclusive community,” said Swaine. According to museum leadership, the museum attracted more than 300,000 visitors to downtown Greensboro during the loan period. One of the things that has helped the museum’s visibility has been increased advertising at the airport and the brown destination signs on the highway which direct travelers to the museum. The contract between the city and the museum stipulated that the city would forgive one dollar for every dollar raised by the museum to help pay back outstanding tax-credit payments. 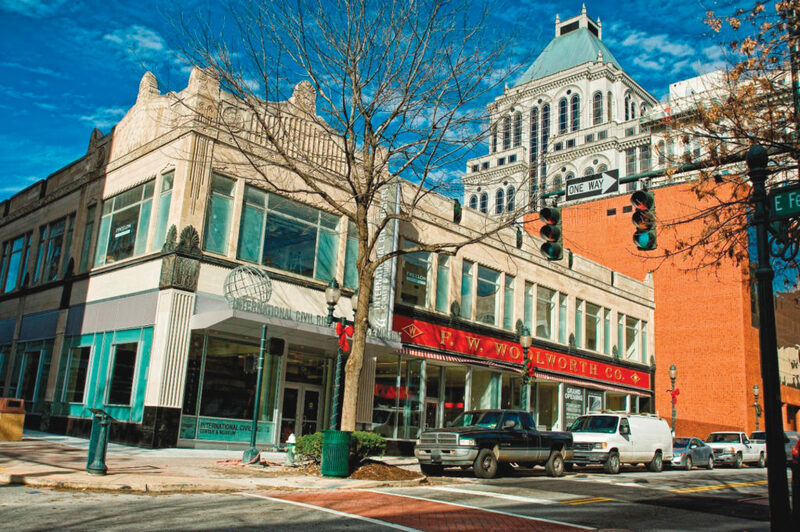 The city’s investment helped the museum maintain the $36 million in tax-credit investments in Downtown Greensboro that funded the restoration of the historic building and the establishment of the museum. ICRCM opened in 2010, inspired by the “A&T Four,” the four North Carolina College (now North CArolina A&T State University) freshmen who led the lunch counter sit-ins at the downtown Woolworth store in Greensboro on February 1, 1960. Although the city had agreed to the loan, in 2014, Mayor Nancy Vaughan and City Manager Jim Westmoreland proposed that the city take over operations of the museum, which was met with tremendous pushback from the community and museum leadership. According to Swaine, the museum has not only seen financial growth, but also numerous accolades. The F.W. Woolworth’s and the ICRCM are listed among the top three of the 14 major sites on the newly inaugurated U.S. Civil Rights Trail; U.S.A. Today’s Readers’ choice ranks the museum as No. 7 of the “10 Best” sites to visit in North Carolina; Tripping.com ranked the museum as the 9th most important institution on the East Coast — in the same category as the Metropolitan Art Museum in New York: and Tripadvisor.com has the ICRCM listed as the top attraction for the last five years in the local area. Swaine said the museum is currently working on establishing a new exhibit highlighting the history of student-led demonstrations. In addition to exhibits, the museum leadership wants to include programs and discussions that lead to community interaction. “That museum has a long future ahead of it. I think that working through the tax credits the first seven years was very expensive. But we’re moving towards the future now, and rewriting a whole new narrative and changing the script,” said Swaine.